The rabbis called him “the Weeping Prophet.” They said he began wailing the moment he was born. When Michelangelo painted him on the ceiling of the Sistine Chapel, he presented him in a posture of despair. He looks like a man who has wept so long he has no tears left to shed. His face is turned to one side, like a man who has been battered by many blows. His shoulders are hunched forward, weighed down by the sins of Judah. His eyes also are cast down, as if he can no longer bear to see God’s people suffer. His hand covers his mouth. Perhaps he has nothing left to say. This introduction tells us a great deal about Jeremiah. He was a preacher’s son, for his father Hilkiah was a priest. He was born in the village of Anathoth, close enough to Jerusalem to see the city walls, but at the edge of the wilderness, where the land slopes down to the Dead Sea. He labored as God’s prophet for forty years or more, from 627 b.c. to some time after 586 b.c. Four decades is a long time to be a weeping prophet. Jeremiah lived when little Israel was tossed around by three great superpowers: Assyria to the north, Egypt to the south, and Babylon to the east. He served — and suffered — through the administrations of three kings: Josiah the reformer, Jehoiakim the despot, and Zedekiah the puppet. He was a prophet during the cold November winds of Judah’s life as a nation, right up to the time God’s people were deported to Babylon. Jeremiah himself was exiled to Egypt, where he died. God did wonderful things for Jeremiah before he was even born. He knew him. He formed him. He set him apart and appointed him as a prophet to the nations. He did all this long before Jeremiah drew his first breath or shed his first tear. 1. God is the Lord of life. God formed Jeremiah in the womb. Jeremiah had biological parents, of course, but God himself fashioned him and knit him together in his mother’s womb. Telling children who ask where babies come from that they come from God is good theology. And it is not bad science either. The Lord of life uses the natural processes he designed to plant human life in the womb. 2. A fetus is a person. A person is a human being, created in the image of God, living in relationship to God. This verse testifies that the personal relationship between God and his child takes place in the womb, or even earlier. Birth is not our beginning. Not even conception is our real beginning. In some ineffable way, God has a personal knowledge of the individual that precedes conception. “Before I formed you in the womb I knew you.” This is the strong, intimate, Hebrew word for “know” that is also used to describe sexual intimacy between husband and wife. “I knew you.” What a beautiful thing for God to say to his children! “I loved you and cared for you in eternity past. I made a personal commitment to you even before you were born.” And what a beautiful thing for parents to say to their children: “God knows you, God loves you, and God has entered into a personal relationship with you.” This verse holds special comfort for mothers who have had miscarriages. It gives hope to parents who have lost children in infancy, and even for women who aborted their own babies. God knew your child, and he knows your child. 3. We do not choose God before God chooses us. If you want to know who you are, you have to know whose you are. For the Christian, the answer to that question is that you belong to Jesus Christ. When did Jeremiah start belonging to God? When did God choose him? The prophet was set apart before he was born. While Jeremiah was being carried around in his mother’s womb, God was making preparations for his salvation and his ministry. To set something apart is to sanctify it or to dedicate it to holy service. Long before Jeremiah was born, God chose him and consecrated him for ministry. Given the intimacy of God’s knowledge of Jeremiah, it is appropriate for Jeremiah to address him with the title “Sovereign Lord” (Jeremiah 1:6). God is sovereign. He not only forms his people in the womb, he sets them apart for salvation from all eternity. God’s choice is not unique to Jeremiah; it is true for every believer. This is known as the doctrine of divine election. “You did not choose me,” Jesus said to his disciples, “but I chose you and appointed you to go and bear fruit” (John 15:16). “Praise be to the God and Father of our Lord Jesus Christ. . . . For he chose us in him before the creation of the world to be holy and blameless in his sight” (Ephesians 1:3-4). This promise is for the whole church. Therefore, it is for the comfort of every Christian. God not only knows you, he chose you; and he did so long before you were ever conceived. 4. Every Christian has a calling. There is a general call, of course, to believe in Jesus Christ. But everyone who believes in Christ also has a special calling to a particular sphere of obedience and ministry. Jeremiah was not just set apart for salvation, he was set apart for vocation. God had work for him to do. The prophet had a mission to accomplish and a message to deliver to his generation. Jeremiah’s unique appointment was to be a prophet to the nations. God intended his ministry to be international in scope. Part of Jeremiah’s job was to promise God’s grace to the nations, proclaiming, “all nations will gather in Jerusalem to honor the name of the Lord” (Jeremiah 3:17). But to be a prophet to the nations also includes announcing God’s judgment. By the time he reached the end of his ministry, Jeremiah had pronounced a divine sentence of judgment upon every nation from Ammon to Babylon. Just as all nations receive God’s sovereign grace, all nations are subject to God’s severe justice. Perhaps you are still trying to figure out what God’s plan is for you. Many Christians long to know what God is calling them to do. If you are not sure, there are at least two things you ought to do. The first is to do everything you already know God wants you to do. You cannot expect to be ready for God’s call, or even to recognize God’s call, unless you are obeying what God has already revealed to you. This includes the obvious things, such as spending time in prayer and Bible study, serving the people with whom you live, remaining active in the worship of the church, and being God’s witness in the world. Second, ask God to reveal his will for your life. If you ask, he has promised to answer. “If any of you lacks wisdom, he should ask God, who gives generously to all without finding fault, and it will be given to him” (James 1:5). Jeremiah knew what God wanted him to do. Yet even after he received his divine call, he was still a dubious candidate: “Ah, Sovereign Lord,” he said, “I do not know how to speak; I am only a child” (Jeremiah 1:6). Was Jeremiah being modest or faithless? Was it right for him to object to God’s call or not? A good way to answer those questions is to compare Jeremiah with some other prophets. Later the Lord reaches out his hand and touches Jeremiah’s mouth (Jeremiah 1:9). This reminds us of Isaiah’s experience when he saw “the Lord seated on a throne, high and exalted, and the train of his robe filled the temple” (Isaiah 6:1). Isaiah had one or two doubts about his calling too, but his doubts were different. Isaiah’s main problem was that he had a guilty conscience: “‘Woe to me!’ I cried. ‘I am ruined! For I am a man of unclean lips, and I live among a people of unclean lips, and my eyes have seen the King, the Lord Almighty’” (Isaiah 6:5Jeremiah 1:5). Isaiah did not doubt his ability, he doubted his integrity. When the seraph flew from the altar to touch Isaiah’s lips with a live coal, he said: “See, this has touched your lips; your guilt is taken away and your sin atoned for” (Isaiah 6:7). Isaiah’s experience was somewhat different from Jeremiah’s. When God touched Jeremiah’s lips, it was not to take away his sins, it was to give him God’s words. What about the call of Moses? Was Jeremiah’s call like the call of Moses? Jeremiah’s objection sounds very much like the objection Moses made when God called him: “O Lord, I have never been eloquent, neither in the past nor since you have spoken to your servant. I am slow of speech and tongue” (Exodus 4:10). Unlike Isaiah, Moses doubted his competence rather than his righteousness. This was precisely Jeremiah’s objection. He was not sure what to say or how to say it. He may have even been concerned about his foreign language skills, since God was calling him to an international ministry. Perhaps his grasp of Akkadian and Ugaritic was deficient. In any case, Jeremiah had his doubts about whether he could do the job. When God gives his servants a clear calling, he does not accept any excuses. “The Lord said to him [Moses], ‘Who gave man his mouth? Who makes him deaf or mute? Who gives him sight or makes him blind? Is it not I, the Lord? Now go; I will help you speak and will teach you what to say’” (Exodus 4:11-12). God said much the same thing to Jeremiah. To put it plainly, he said, “Don’t give me that stuff!” “Do not say, ‘I am only a child.’ You must go to everyone I send you to and say whatever I command you’” (Jeremiah 1:7). “Then the Lord reached out his hand and touched my mouth and said to me, ‘Now, I have put my words in your mouth’” (Jeremiah 1:9). God did not disqualify Jeremiah on the basis of his youth and inexperience. In fact, he treated him the same way he treated Moses. He did not deny the basis for the prophet’s objection. He did not argue with Jeremiah about his speaking credentials or quibble with him about his age. Jeremiah may have had reasonable doubts. But God exposed his false humility for what it really was: a lack of faith. Jeremiah had forgotten that God is not limited by human weakness. God himself possesses everything Jeremiah needs to answer his call. In fact, enabling weak tools to do strong jobs is God’s standard operating procedure. His entire work force is comprised of dubious candidates. When God calls someone to do a job, he gives him or her all the gifts needed to get the job done. With God’s calling comes God’s gifting. This does not mean that your gifts and abilities do not matter when you are trying to figure out what God wants you to do with your life. They do matter. If you do not know what God is calling you to do, take an honest look at the gifts he has given you. If necessary, ask others to help you figure out what your gifts are. If God has actually called you to do a particular job, then he will do for you what he did for Jeremiah: He will give you everything you need to do that job. If you think you know what the Lord wants you to do with your life, get busy, trusting him to give you the grace to answer his call. Once God had issued his divine call and dealt with his dubious candidate, he gave him a dangerous commission: “You must go to everyone I send you to and say whatever I command you. Do not be afraid of them, for I am with you and will rescue you” (Jeremiah 1:7-8). God’s promise to rescue Jeremiah is also a bit worrisome. Rescued from what? The promise suggests that the prophet will fall into grave danger. God does not promise that Jeremiah has nothing to fear or that he will not need to be rescued. But he does command him not to be afraid, and he does promise to rescue him. Once there was a man who understood the danger of the prophet’s commission and the comfort of God’s presence. He was an evangelist God used to bring renewal to the Colombian church during the 1980s and 1990s. Since he was an enemy of the drug cartels, his life was in constant danger, until he was finally gunned down by assassins. Yet shortly before he died, he said, “I know that I am absolutely immortal until I have finished the work that God intends for me to do.” God’s servants are indeed immortal until they have completed their service. Not only did Jeremiah have God’s presence at his side, he also had God’s words on his lips: “Then the Lord reached out his hand and touched my mouth and said to me, ‘Now, I have put my words in your mouth’” (Jeremiah 1:9). This is another connection between Jeremiah and Moses. God promised that he would raise up a prophet for his people like Moses: “I will put my words in his mouth, and he will tell them everything I command him” (Deuteronomy 18:18). Whenever Jeremiah spoke in God’s name, God was the one doing the talking. Who wrote the book of Jeremiah? From one point of view, it contains the words of Jeremiah, as the Scripture says: “The words of Jeremiah son of Hilkiah” (Jeremiah 1:1). From another point of view, however, these are the words of God himself: “The word of the Lord came to him” (v. 2). The Bible is never embarrassed to speak this way. There is a meaningful sense in which the words of Jeremiah are recorded in the pages of the Old Testament. The book of Jeremiah gives us a glimpse of the personality and experiences of the man, Jeremiah. But at the same time the Holy Spirit is the One who breathed out the words of the book of Jeremiah. “Prophecy never had its origin in the will of man, but men spoke from God as they were carried along by the Holy Spirit” (2 Peter 1:21). The book of Jeremiah is God’s words and Jeremiah’s words. When we read them, we do not just see God through Jeremiah’s lens; God speaks to us directly. The reason Jeremiah has authority “over nations and kingdoms” (Jeremiah 1:10) is that he is not speaking on his own behalf. God is sovereign over the nations, and he rules them by his Word. When prophets speak in his name they are mightier than kings. When preachers preach according to God’s Word they are mightier than presidents. I think it was a good answer. God rules the nations of this world by his Word. Those who have been appointed to preach that Word have a spiritual authority over the nations. The Lord instructed Jeremiah to be a bold prophet, not because of his preaching ability or because of his age and experience, but because he was called to speak God’s own words. It was not always easy for Jeremiah to speak God’s words. His commission was not only dangerous, it was often depressing. We have already been given a clue that the book of Jeremiah does not have a happy ending. It ends with the people of Jerusalem being sent into exile. Thus the book of Jeremiah is a tragedy rather than a comedy. It is about the unraveling of a nation. It is the sad story of the decline of God’s people from faith to idolatry to exile. It is this decline that makes Jeremiah a prophet for post-Christian times. He lived in a time very much like our own, when people no longer think God matters for daily life. Public life is increasingly dominated by pagan ideas and rituals. Some people still meet their religious obligations, but they do so out of duty rather than devotion. The spiritual problems we face at the dawn of the twenty-first century were the same problems that Jeremiah found depressing 2,500 years ago. The discouragement of his ministry is evident from the verbs God uses to describe it: “See, today I appoint you over nations and kingdoms to uproot and tear down, to destroy and overthrow, to build and to plant” (Jeremiah 1:10). The prophet’s job description includes six tasks, and four of them are negative. Two to one, his words to the nations will be words of judgment. “To uproot” is to dig up nations by the roots and turn them under. It is a word that Jeremiah uses more than all the other biblical writers combined, often to describe the uprooting of idols (e.g. Jeremiah 12:14-17). To “tear down” is to tear down a standing structure, like knocking down a city wall or toppling a tower. “To destroy” is another word for knocking things down. To “overthrow” is to demolish, to bring to complete ruin. Once the Lord uproots, tears down, destroys, and overthrows a nation, there is not much left. There is a great deal of that kind of judgment in the rest of Jeremiah’s book. This verse is not only Jeremiah’s job description, it is also a helpful plot-summary of his book. He lives in such evil days that judgment will outnumber grace two to one. But grace will have the last word. When the cities of evil have been torn down and plowed under, God will start afresh. He will begin a new work. He will “build” and he will “plant.” He will bring renewal out of demolition. This is God’s plan for the kingdoms of this world (cf. Jeremiah 18:7-10). He is the one who is in charge of the beginnings and endings of history. He is the one who uproots some nations and plants others. He is the one who tears down some kingdoms and rebuilds others. This is also God’s plan for salvation in Jesus Christ. Jesus said, “Destroy this temple, and I will raise it again in three days” (John 2:19). The temple of Jesus’ body was uprooted and torn down from the cross. It was destroyed and overthrown to the grave. But God built and planted resurrection life into the body of Jesus Christ. Now God builds and plants that same resurrection power into the life of every believer. First the Holy Spirit uproots and tears down sin in your heart, and then he plants faith and builds obedience into your life. Like Jeremiah, you were a dubious candidate at the beginning. Yet God has known you from all eternity, and he has set you apart for new life in Christ. If God has done all that for you, will you go wherever he tells you to go, and say whatever he wants you to say, even if it turns out to be a dangerous commission? 1. Eugene H. Peterson, Run with the Horses: The Quest for Life at Its Best (Downers Grove, IL: InterVarsity, 1983), p. 38. 2. F. B. Meyer, Jeremiah: Priest and Prophet, rev. ed. (Fort Washington, PA: Christian Literature Crusade, 1993), p. 17. 3. J. R. R. Tolkien, The Fellowship of the Ring (Boston: Houghton Mifflin, 1965), p. 70. 4. R. E. O. White, The Indomitable Prophet: A Biographical Commentary on Jeremiah (Grand Rapids, MI: Eerdmans, 1992), pp. 4-5. 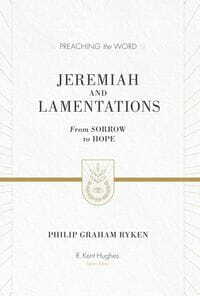 Taken from Jeremiah and Lamentations: From Sorrow to Hope by Philip Graham Ryken. Used by permission of Crossway, a publishing ministry of Good News Publishers, Wheaton, Il 60187, www.crossway.org. While the book of Jeremiah shared the last, desperate days of the Jerusalem the prophet loved, Lamentations expresses the cries of his heart. Yet they reveal more than the prophet’s grief—they are an attempt to reflect on the meaning of human suffering. Lamentations gives voice to the deepest agonies, with the hope that some comfort may come from crying out to God for mercy. Together the two books illustrate the eternal principle that man reaps what he sows.